Referred to as = Value / Conv. If you have a campaign with multiple conversion values this metric provides you with the average value of those conversions. 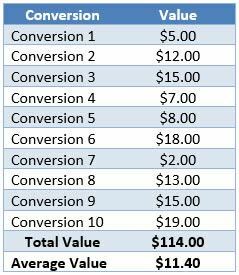 If however you have a campaign which only ever provides one conversion type and hence it has only one value, this metric will be of no value as the average conversion value will simply be the conversion value or the conversion. This is more useful when looking at a lot of data either across multiple campaigns or for shopping and ecommerce sites where the average conversion value is more relevant. Here we see the average conversion value is $11.40 across those conversions. Referred to as = Value / All Conv. As discussed earlier, ‘converted clicks’ differs from ‘conversions’ and is typically a smaller number than conversions. Because a user may convert multiple times after Clicking only one ad, converted clicks only represents the number of clicks that resulted in a conversion. Consequently this metric will typically be a smaller value than the conversions metric.